After tips from eager sea paddlers in northern Norway, we have begun retailing Brooks Greenland Paddling Gear. Brooks is a family company from Vancouver, Canada, which has been producing paddling gear for over 30 years, and they are market leaders in North America. Early on they introduced a special collection of "Greenland gear". Greenland gear includes Tuilik, the traditional paddling jacket, Akuilisaq, spray cover, Kamik, boots, and gloves to go with the tuilik. The tuilik (pronounced do-ee-leak) is probably the single greatest new item. 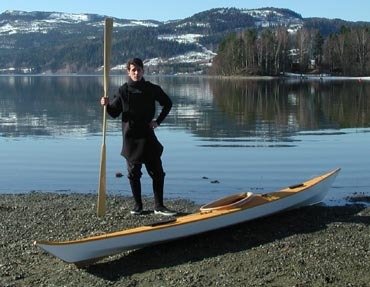 It's a wonderful garment for cold days, rolling practice or just having fun with a kayak. "With a tuilik it's summer all year", someone said, and they're right! The wonderful thing is having a completely watertight jacket that's still soft, comfortable and well insulated. The hood prevents water reaching your head, and you can practice capsizing and rolling over and over again, usually without becoming dizzy, cold or otherwise unwell. Jacket and spray cover are one item, which means that you don't sweat as much as with a normal jacket. When on land, the tuilik reaches past your knees, and you stay nice and warm even in cold winds. They say that a tuilik provides enough updrift to keep a man afloat, just like a lifevest. We advise against relying on this, as you should always use a lifevest when paddling. Nevertheless, we tested this in practice, to see if the saying is based on fact. I have repeatedly gone swimming with a tuilik during 2006. The statement about flotation ability is partially true. You float noticeably better with a vest, though, and I say that you should always use a vest. You can, however, acquire a small vest to be worn under the tuilik. As for insulation, the tuilik performs admirably, especially when combined with a neoprene long john. In my opinion, drysuits are a bit messy, but I stayed reasonably warm with the long john, despite my natural tendency to freeze. The lowest temperature I tested this at was 10Â°C (50Â°F). In conclusion, this is very good equipment. 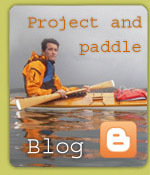 It's not surprising that gear developed over the course of a thousand years for daily life in the kayak works well. This is noticeable with Brooks' equipment. Tuilik, kamik and gloves form the perfect suite for a trip you expect to be wet or cold.